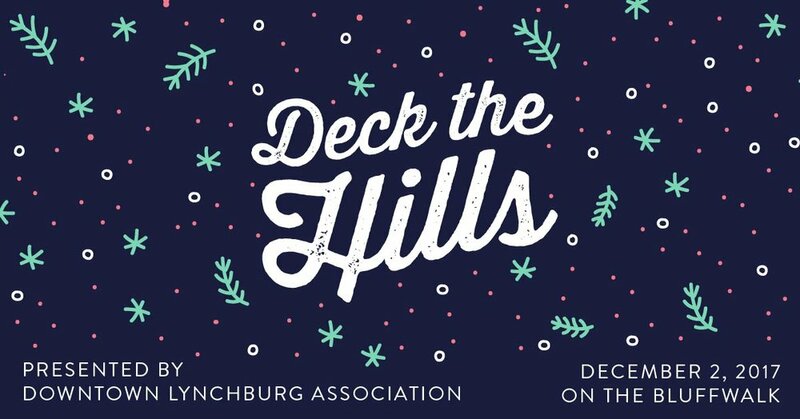 With the very first Deck the Hills event just around the corner, we want to make sure to get all your questions answered. Here is what you need to know. The event begins at 4pm and ends at 8pm. The voting for the best Christmas Tree will end at 7pm to allow us to talley the results. We will announce the winner at 7:45pm at the Craddock Terry Hotel, followed by a tree lighting ceremony. For those who have yet to explore Lynchburg's newest pedestrian walkway, the Bluffwalk is located between Jefferson and Commerce Streets, and runs from the Craddock Terry Hotel all they way to 10th Street. How does the Christmas Tree competition work? 25 Downtown Businesses will be competing for your votes! Their trees will be displayed all along the Bluffwalk, and you can vote for your favorite or favorites by slipping cash or a voting ticket into the voting box beside the tree. $1 = 1 vote, and you can either vote directly with cash or purchase voting tickets from one of our volunteers. All proceeds from this competition will go to support Downtown Lynchburg Association. Does the event cost money? No, it is absolutely free. However, if you plan to purchase food and drink, or vote on your favorite Christmas tree, make sure to bring your wallet. Most vendors take credit card but you should bring cash just in case. Yes! There will be specialty food and beverage vendors on site, selling coffee, hot chocolate, kettle corn, cider donuts, apple cider, and more. Plus, there are so many restaurants on and around the Bluffwalk to grab dinner. Yes! Live music will be played throughout the evening. There are many public parking options available to you. Along with free and unlimited street parking throughout downtown, you can park in one of the many public lots and parking decks listed on our parking map. Unfortunately, no. Although we love, love, love dogs, the City prohibits dogs at large public events to ensure public safety.